Project teams are the rule rather than the exception in today's organizations. But thanks to the pressure of performance goals, conflicting agendas, and political jockeying, few teams make superior decisions consistently. Instead, team members communicate poorly or not at all, avoid provocative discussion, occasionally stab each other in the back, or in many other ways forget that their job is to make decisions that lead the company forward. Jana Kemp, an authority on team decision making, saves the day by offering tested methods and tools team members and their leaders can use to ratchet up the performance level. That not only makes team projects more successful-it makes work fun. 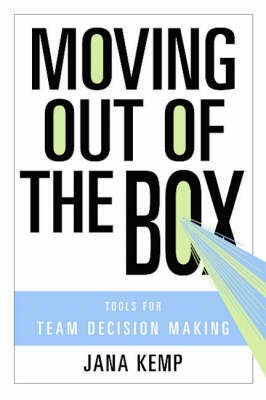 Kemp argues that the way to make good decisions is to have an expansive group conversation that leads to sound decisions and swift execution. Sounds simple, but in most organizations, making a decision and seeing it through can become an exercise in frustration for managers and employees alike. At one end of the spectrum are command-and-control decisions, proclaimed from on-high and implemented through the ranks. Without input or buy-in from those affected by the decision, this approach can lead to resentment and backlash. At the other end are purely collaborative, consensus decisions that often lead to inoffensive, weak choices and sub-par results.